Everything you need to know to declutter your pantry and fridge in 3 simple steps. To tackle the pantry and fridge, those two problem areas that cause alllllllllllllll the kitchen chaos? To create a simple, streamlined solution so you can prepare beautiful, healthy real food with ease? Read on for the simple decluttering process, step by step. Grab Your Free Guide to Walk Through The Decluttering Process Step-By-Step! Grab the free guide and declutter with ease. listen to the podcast episode! Okay, I know you’re pumped to get started--totally ready to start Kond-ing your way to a perfectly tidy and organized pantry. But let’s press pause for just a second. Because before we dive into decluttering, it’s important to get clear on why you’re actually doing this in the first place. Starting with your “why,” makes a big difference when it comes to decluttering, and will help you keep it up in the long term (hint: see Simon Sinek Start with Why for more on why “why” is such a game changer). So before diving in, I want you to take a few moments to reflect on why decluttering in this area will make a difference in your life. To help you out, I created a free Simplified Guide to Declutter Pantry & Fridge to walk you through this process step-by-step. Now, as you’re thinking about your why, I have a little hint to get you started, particularly about what your why is not. I’m guessing you’re not decluttering just for the sake of having a pantry that looks perfect, or to organize just for the sake of organizing. No, I’m guessing instead that your why has more to do with something like streamlining the daily process of preparing meals. Because when you can clearly see what you have, it’s easier to pull together healthy meals, effortlessly. Or maybe your why has to do with simplifying grocery shopping. Because when you know what you have on hand, it’s much easier to pull together a grocery list of the exact items you actually need. Or maybe your why has to do with how you’ll feel when opening up your decluttered pantry and fridge. How you’ll have fewer decisions to make each day, and therefore more time and energy for the things in your life that matter most. Because when you know what to buy--when you can clearly see what you have and what you need--meal planning, prep and cooking become a whole lot easier. Which means you’ll be able to eat real healthy food, simply, and with less effort. Now that’s a why that makes a big difference! 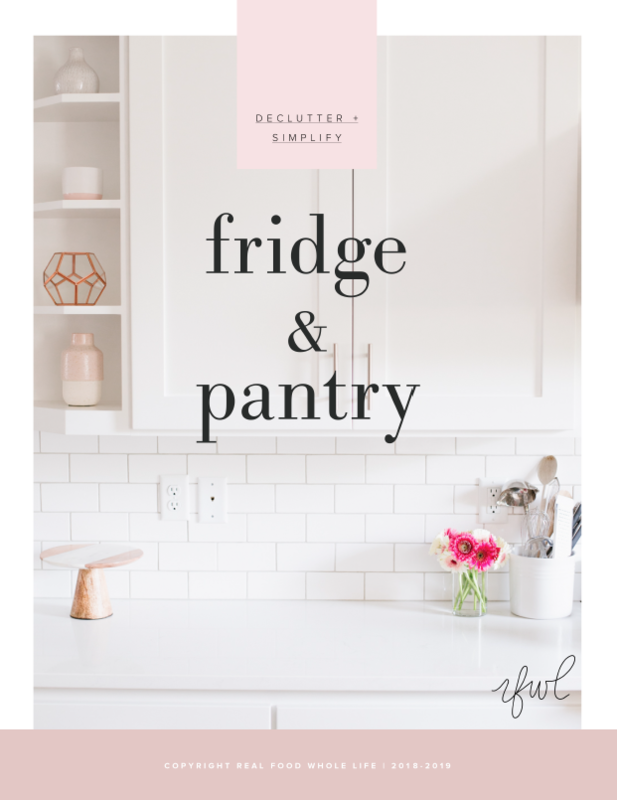 Be sure to grab the free Simplified Guide to Declutter Pantry & Fridge so I can walk you through this process, step-by-step. If finding your why seems daunting or overwhelming, here are some specific questions to get you started. How do I feel now when looking at my pantry & fridge? How will I feel after? How will decluttering make preparing meals easier? How will eating well impact how I feel? How will it impact other people in my life? Remember, your answers don’t have to be perfect, they are just there to give you the foundation and motivation to take on the next step in the decluttering process. Okay, you’re all set with your why--you’re crystal clear on why you’re even doing this in the first place. Now it’s time to take some action. Let’s make it happen. The first action step in decluttering the pantry and fridge is to take everything out. Don’t overthink in, just take it out and put it all on the counter. A quick note, though, as you get started with the clear-out: please don’t let perfection, comparison, and all-or-nothing thinking be the enemy of action. Look, I get it--it’s so easy to get sucked into the all-or-nothing/perfection/comparison trap in this first step. But I’m here to encourage you to resist the urge. Take this step at your own pace, and in your own way. Just don’t put it off altogether. And if taking everything out all at once seems overwhelming, try these ideas for breaking the task into smaller pieces. If you want to go big, try setting aside a half-day to tackle the entire thing: fridge, freezer, pantry. Or would you rather take a more incremental approach? Take on one area at a time: first pantry, then fridge, then freezer. If you’d prefer to take even smaller steps, do just one area at a time: one shelf, one drawer, one bin. There’s no one right way when it comes to this clear-out step, there’s just the way that works for you, which, p.s. is the way that you’ll actually do. If you find yourself getting overwhelmed or putting it off, back off and and start with a smaller step. Now that you’ve finished the clear-out step, it’s time for the second pantry & fridge decluttering step: deciding what to keep and what to let go. This step is so important, because remember, we’re not just looking to just organize here, we’re looking to actually declutter. Which means letting some things go. This is the ideal time to take stock of fridge and pantry staples, and to get rid of anything that’s not serving you and your health goals. So how do you decide what to keep and what to let go of? Let’s talk about the rule of 5. The rule of 5 is a simple decision rule to help you decide what stays and what goes. Here’s how it works: take each packaged item (anything with a label), and do a quick scan of the ingredient list. Anything with more than 5 ingredients, or with unpronounceable ingredients/words can go. Toss it, donate it, whatever works best for you--the main thing is to get rid of pantry and fridge staples that are super-processed or filled with less-than-healthy ingredients. Again, we’re not looking for perfection here, just awareness. If you’re not ready to toss the processed salad dressing, or frozen pizza, go ahead and keep it, but do consider replacing it with an upgraded option next time you’re at the store. There are, of course, exceptions to the rule of 5--maybe your favorite gluten-free bread or those splurge-worthy cookies. Just start small and build, allowing wiggle room for your own tastes and preferences. Okay, now that you’ve cleared everything out, and let go of items that are no longer serving your health goals, it’s time to get organized in order to see what you have more clearly. Again, let’s go back to your why. Remember, this is about simplifying and streamlining so healthy food becomes easier, not necessarily organization for organization’s sake. Yes, having items organized in clear containers looks pretty, but the real point is to be able see what you have, and make better decisions about what you need. So if you don’t have the perfect containers at the moment, don't let that stop you from using what you have on hand. Glass mason jars are a great way to organize the pantry, fridge, and freezer, are easy to find, reusable, and inexpensive. Here’s a complete guide to using mason jars to store anything. I also use these glass jars and these baskets to keep items together and easy to see. Repurposed glass jars or other containers work well, too, so look around and see what you have. Once you have designated containers, transfer lose snacks, cereals, nuts, seeds, and grains to them. Now you’ll easily be able to see what you have and what you need, which will streamline grocery shopping and meal prep. As a bonus, storing food in tightly sealed jars will keep items fresher longer. Now that you’ve decluttered, it’s time to put everything back. First, gather ingredients and food item, putting them back in the fridge and pantry by type. For example, group proteins together in the freezer, and place grains together in the pantry. Snacks and cereal can go together on another shelf, and baking items can be grouped together as well. No need to over-think this part, just do the best you can, putting items together in a way that makes the most sense to you. You’ll find that having items together makes meal prep and planning so much easier, plus gives you a better sense of what you have and what you need. Okay everything is back in place--you’re in the home stretch! Now it’s time for the bonus round: do an audit of your fridge, pantry, and freezer. This is more of an advanced step, but it does really help in simplifying meal prep, planning, and grocery shopping. The purpose of the audit is simple: to create a list of grocery items necessary to fill in any gaps that you’ve uncovered as a result of decluttering. Because you’ve already organized the fridge and pantry by type, it should be pretty easy to see what’s missing, and as well as to see what needs to be replaced. Check the pantry and fridge, create the list, and then work on adding these items back over the coming weeks. This doesn’t have to happen all at once--just a few items at a time will get you where your want to go. Tip: Stock up on essentials such as shelf-stable items and protein when they go on sale, either online, or at your local grocery or wholesale store. Freeze what you can’t use within a few days in individual serving sizes. Okay, you amazing human, you’ve made it to the last step. The magic list is the last step in decluttering your pantry and fridge, and will help you maintain the work you’ve done to declutter, plus drastically cut down on the amount of time you spend figuring out what you need to buy at the grocery store. Using a piece of paper or notes function on your phone (I prefer the phone option, as that way you’ll always have it with you), write out a list of pantry and fridge staples. These are items you use often, the items to keep on hand all the time. Then, as you make your grocery list each week, take a quick look at the magic list to see what you might need to grab or stock up on. Keep the list updated between store and pantry and you’ll always have staples on hand. Simple, streamlined, and totally worth the effort. Good job--for doing the work, and taking the time to work through these steps! Now that you have a decluttered fridge and pantry I hope you find planning, prepping, and cooking real, healthy food becomes so much easier. More Simplified Home You'll Love!